At last night's meeting of the Burns Club of Atlanta, Ann and I had the opportunity to hear journalist Tom Junod talk about New Journalism and some of his more famous and notorious exploits at Esquire magazine. While I remain skeptical about the journalistic value of some of Junod's pieces – in particular, his extremely well-written fictional meeting with former Attorney General Alberto Gonzalez – Ann and I were both struck by a piece he wrote for Esquire in September of 2003, "The Falling Man." 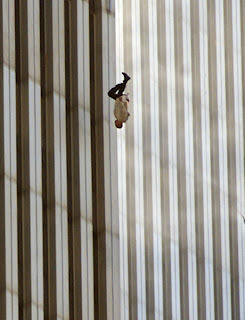 "The Falling Man" is an article about the above photograph taken by Richard Drew at 9:41:15 a.m., on September 11, 2001. The subject of the image was one of the people (dubbed "jumpers" by the press) trapped on the upper floors of the building who apparently chose to jump rather than die from the fire and smoke. The photographer has noted that, in at least two cases, newspaper stories commentating on this particular image have attracted a barrage of criticism from a readership who find the image deeply disturbing. In fact, at last night's meeting Junod cited this criticism, and the associated removal of the photograph from the 9/11 canon, as inspiration for his article. A man I went to college with was in the South Towe that morning. Thankfully he made it down the stairwell in time to et beneath the second plane's impact. I'll never forget the email where he described getting to the lobby and running across the plaza ... where jumpers and papers and glass were raining down around him. He provided no description of the scene except to say that the plaza was indescribable and that the sound of the people hitting the pavement was louder than any gunshot or explosion he'd ever heard. That idea, of that horrible noise, has stuck with me. Thankfully Junod's article helps put that terrible kernel in context. "The picture went all around the world, and then disappeared, as if we willed it away. One of the most famous photographs in human history became an unmarked grave, and the man buried inside its frame -- the Falling Man -- became the Unknown Soldier in a war whose end we have not yet seen. Richard Drew's photograph is all we know of him, and yet all we know of him becomes a measure of what we know of ourselves. The picture is his cenotaph, and like the monuments dedicated to the memory of unknown soldiers everywhere, it asks that we look at it, and make one simple acknowledgment. That we have known who the Falling Man is all along." With full appreciation of the irony inherent in blogging about an author who disparages the role of bloggers, we wanted to share this powerful piece of journalism. Read "The Falling Man" at Esquire.com.